Fig.1a: Experimental setup of the confocal microscopic spectrometer including LED (1), imaging camera (2), motorized stage (3), spectrometer detector combination (4), round-to-angular fiber bundle (5). In many fields research bases on investigations of small structures in the sub-micrometer to nanometer range, so as in cellular imaging and tracking experiments in biological research or in investigations of local inhomogeneity in material sciences, for examples. 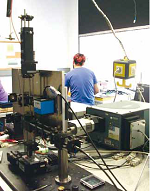 Simultaneously, the characterization of bonding conditions and the identification of components is of great interest. This requirement makes microscopic spectroscopy an important investigation method. Enormous progress was achieved in microscopy development in recent years, e.g. by localization of fluorescent markers below the diffraction limit, design of the microscope point spread function, by structured illumination and combination high resolution techniques like electron microscopy with light microscopic methods attributed to in-vivo measurements. It is a big challenge to give consideration to accelerated development in science and technology in practical engineering education. In order to impart a broad overview over spectroscopic and microscopic applications and permit changeability, we established a variable laser scanning microscopic setup that measure reflection, fluorescence and Raman scattering signals. The feasibility of correlative electron microscopy is included and the system is extendable. Fig.1b: Detailed image of the objective and the sample holder for correlative SEM microscopy. Fig. 2: Confocal reflection image of one star of a 1 cent coin using pinholes of 100 μm in diameter and 50x/0.8 objective. The 3D presentation is created by ImageJ software. The data are acquired by the bachelor student Patrick Rönsch. On the basis of a cage system a microscope is constructed in upward position according to Köhler illumination. Using a white light emitting diode ((1) in fig.1) and camera detector (2), overview images of the sample can be obtained and processed in LabView. Simple mirror flipping enables the change to a laser scanning confocal microscopic setup. Via fiber optics light of an Ar-ion laser can be introduced into the system to establish fluorescence and Raman measurements, so as a Xenon cold-light source for reflection measurements to avoid speckles respectively. 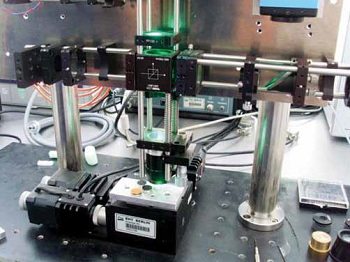 A motorized xyz-stage ensures the scanning of the sample to take advantage of the whole aperture at each data point. The confocal pinholes are positioned in conjugated image planes behind the laser and in front of the camera exit respectively. Finally the signal is analyzed by a combined Shamrock SR 303i-A spectrometer and an Andor open electrode iDus DU420A-OE detector system (4). To ensure high spectral resolution the entrance slit of the spectrometer needs to be illuminated homogeneously which is obtained by a round-to-angular optical fiber bundle of LOT-Oriel ((5) fig.1). The sample holder (fig.1a) can be introduced into a scanning electron microscope to correlate fluorescence or Raman scattering results with high resolution surface morphology measurements under vacuum conditions. Fig.3: 3D volume image demonstrating the distribution of fluorescent stain in a polymer matrix. Dark regions are areas of high fluorescent intensity. Each length of an edge is 20 μm. The sample has been illuminated by 488 nm of an Ar-ion laser. Various joint student projects can be realized, so as instrumentation control via LabView, measurement of the confocal microscope point spread function in x-,yand z-direction using quantum dots and the accurate adjustment of the pinholes, so as the evaluation of resolution depending on pinhole size. Moreover correlative microscopy ensures complementary information of fluorescence and high resolution measurements of the surface morphology. Furthermore Raman scattering signals are measured with a spatial resolution determined by the confocal microscope. A reflection image of one star of a 1 cent coin is shown in figure 2. Another example demonstrates the distribution of fluorescent stain in a polymer matrix of (20 x 20 x 20) µm3. The 20 acquired stacks are processed using ImageJ for 3D presentation in figure 3. A profound theoretical and technological understanding of microscopy and spectroscopy and their applications can be achieved in student projects by applying, varying, and reconstructing of our multi-modal imaging instrumentation. Collaboration of the applied physics department with the department of biotechnology guarantees the investigation of interesting samples.